Korg has announced today that it will be bringing three new keyboard offerings to the market for 2017: an iteration of the flagship Kronos, a limited edition version of their SV–1 Stage Piano, and a brand new digital piano series. First up is the Kronos LS, housed in a new dark umber brushed aluminum panel with two–tone burst wood side panels. It's a copy of Korg's flagship offering, but equipped with a Light–Touch keyboard. Weighing in at 40 pounds, this makes the keyboard a much more portable counterpart to the 88–key fully weighted flagship. The keyboard features nine versatile sound engines, up to 16 simultaneous effects, and 16 part combinations. Korg also states that the mechanism has been redesigned for better velocity. The Kronos LS ships with the newest version of Korg's operating system, which allows for quick Layer/Split via the color touchscreen. For ease of use while performing live and to cut down on editing time, layers and splits can also be saved on the spot to a combination. The Kronos LS will hit the markets in April at $3,499.99. The SV–1 has been a longstanding mainstay in Korg's lineup. The company has released various updates to the classic stage piano over the years, and for 2017, it's releasing a limited edition, high–gloss metallic red variant. This release will be available in both 73– and 88–key versions and will feature Korg's RH3 Real Graded Hammer action and red panel LEDs that will accentuate the tube, rotary encoders, and favorites buttons. The keyboard itself is equipped with a slew of sounds, from electric and acoustic pianos and classic organs to funky clavs and string instruments. Both variations will be available in April, with the 73–key selling for $1,499.99 and the 88–key selling for $1,699.99. 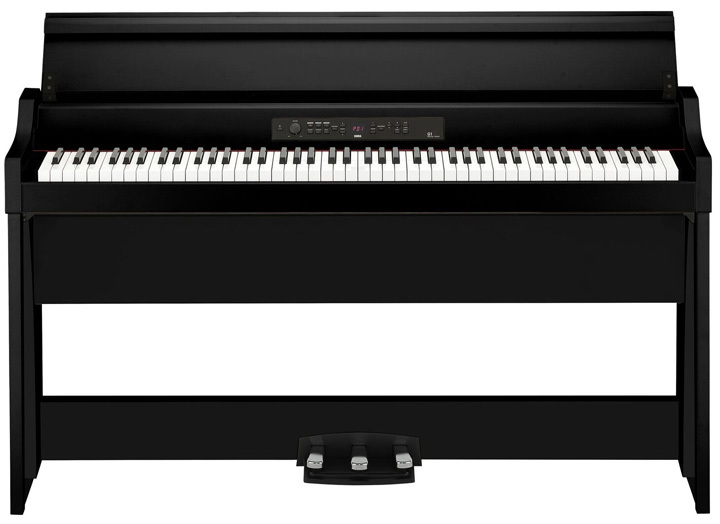 The G1 and G1 Air are two brand new digital pianos that Korg will be bringing to the market this summer. The keyboards are fully loaded with features, including string resonance and spatial modeling, three pedigree piano sources (German, Austrian, and Japanese), RH3 weighted action, high-end full range speakers, and three pedals. In addition to the world–class piano sources, the keyboards also include 32 extra sounds including organs, clavs, and strings. The G1 Air adds to these features with the inclusion of a bluetooth audio receiver that allows players to play along with audio and video tracks and also allows the keyboard to act as a bluetooth speaker. Prices are still TBD for both of these models, but the G1 Air will hit markets in June with the G1 following a month later.